If you love nature and want to be wowed beyond your imaginations, then you need to visit some of the breathtaking, captivating and astonishing waterfalls domiciled in different parts of Nigeria. The warm and cool ambiance of these waterfalls makes it a perfect place to go for picnics, organise small parties as well as a getaway. Jumia Travel shares some of the wonderful waterfalls to visit. 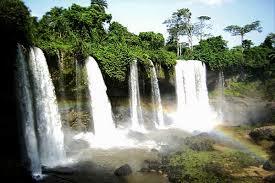 Agbokim waterfall is located in Calabar, one of Nigeria's most popular tourist hubs. It is very close to the Nigerian-Cameroon border. The captivating and alluring serenity of the waterfall makes it a first choice among tourists from far and wide.